Dancers are always concerned with maintaining or increasing the flexibility in their muscles. To really understand how muscles become more flexible we need to understand how to change the fascia that connect to the muscles. Most dancers know that fascia, which is the dense connective tissue that surrounds the 200+ bones and the 600+ muscles of the body. It keeps structures (like muscles) separated from each other yet interconnected in a 3D like web. 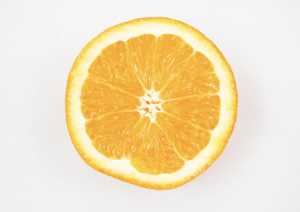 Using an orange analogy, the outer rind is like the superficial fascia, and the sections of orange are similar to the fascia that surrounds our muscles, bones, nerves, etc. Fascia ties and connects everything together! This is why if you have tightness in your neck, it may be influencing the flexibility of the hamstrings. There is a fascial line that connects the muscles along the back of the body called the superficial back line. I mention this because it bears repeating that if you are not getting the results that you want from your stretching efforts – look at other areas of the body that may be holding tension and creating a pull or tightness along the fascial line. This young man is a perfect example of this. He was taking yoga classes and a student in the opera department. We found the tension at his neck significantly influenced his hamstrings. He was doing lots of hamstring focused stretching in yoga class but until he focused on releasing his neck tension he was unable to get release and relief along that back line. 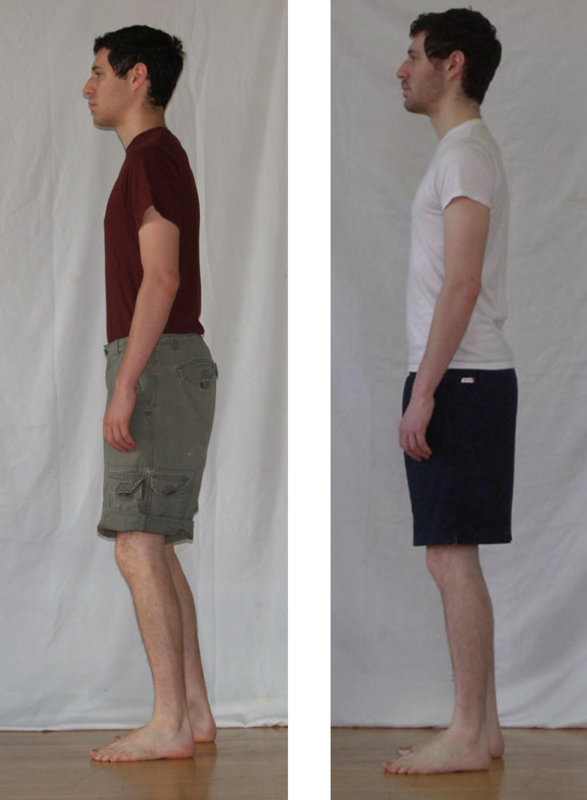 Doesn’t he look WAY more comfortable in his body in the picture on the right? That change took 3 months. As a side benefit – his vocal technique improved too! Now back to talking about fascia and plasticity. Plasticity means the ease with which something is molded or shaped. Fascia will reshape itself when there is a slow, steady and sustained pull on it. Too fast of a stretch and fascia/muscle tears. Plasticity is different from elasticity. Elasticity is the ability of tissue to stretch and then go back to its original shape. Plasticity means the tissue over time (think potentially weeks/months) slowly reshaping itself into a new length. That is what dancers want from their stretching. Bottom line… slow, steady, sustained stretching is the way to go. Doing some of that passive stretching that dancers love to do at the end of class can be very useful (at the end of class – not the start!) If you add on some muscular engagement from the opposite of the joint – you will get even more benefit! For example doing the typical standing quad stretch is good – but when you also lightly engage the glutes while using the abdominals to keep the pelvis in neutral – it becomes even more effective of a stretch! Hold that stretch for 30 seconds, take a quick break and then go back for another 30 seconds and see how your quads feel! If you want to actively explore fascial properties and new ways to train your fascia to be both elastic and responsive think about joining me in the South of France this summer! I will be doing a deep dive into fascial training, alignment assessments, and exploring body/brain strategies for optimal performance. Registration is now open! Dance Teacher Workshop in France!